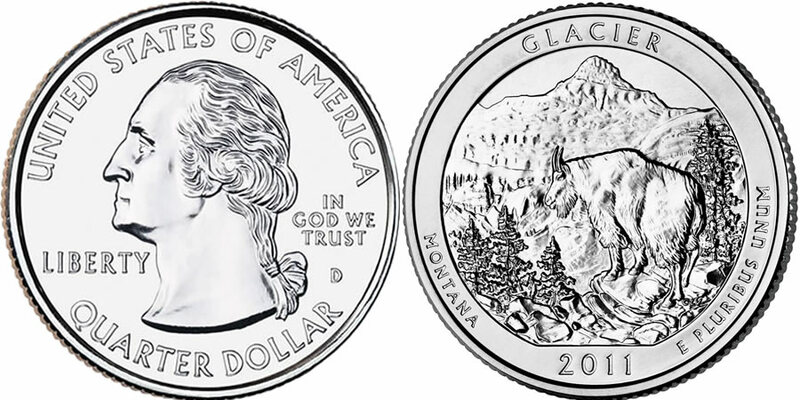 The 2011 Glacier National Park Quarter will appear from the US Mint as the second of five 2011-dated strikes in the America the Beautiful Quarters® Program. The Mint has indicated the coins will be released for circulation on April 4, 2011, at which time it will also begin selling bags and rolls of the strikes. In addition to these circulating quarter dollars, the United States Mint is also issuing two other series of coins with these same basic designs that honor sites of national interest from around the United States. These two other series are both struck from five ounces of .999 fine silver to a diameter of three inches and are known as the America the Beautiful Silver Bullion Coin™ Program and the America the Beautiful Five Ounce Uncirculated Series. 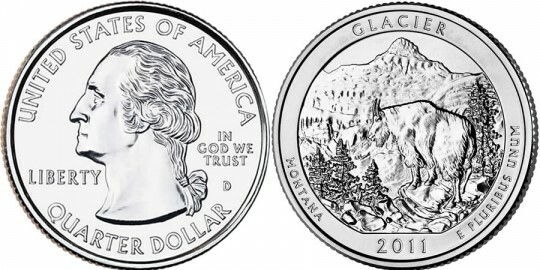 This specific coin honors Glacier National Park of Montana which was originally established in 1897 as a forest reserve. It was redesignated in 1910 to a national park and today receives over two million annual visitors. The inscriptions of "UNITED STATES OF AMERICA," "QUARTER DOLLAR," "LIBERTY", "IN GOD WE TRUST" and the mintmark surround a portrait of George Washington on the obverse of all of the America the Beautiful Quarters. It was originally designed by John Flanagan and first used on the 1932 circulating quarter dollar. On the reverse, an image of a mountain goat is shown climbing on the rugged landscape with Mount Reynolds depicted off in the distance. Surrounding the scene are the inscriptions of "GLACIER," "MONTANA," "2011" and "E PLURIBUS UNUM." The coin's reverse was designed by AIP Associate Designer Barbara Fox and sculpted by United States Mint Sculptor-Engraver Charles Vickers.